This carrier board has been developed for the Freescale MMA8451Q 3-axis accelerometer, a great low-g sensor with 14-bit digital output, I2C communication and adjustable sensitivity (±2g, ±4g or ±8g), and it includes all the external components required by the sensor. 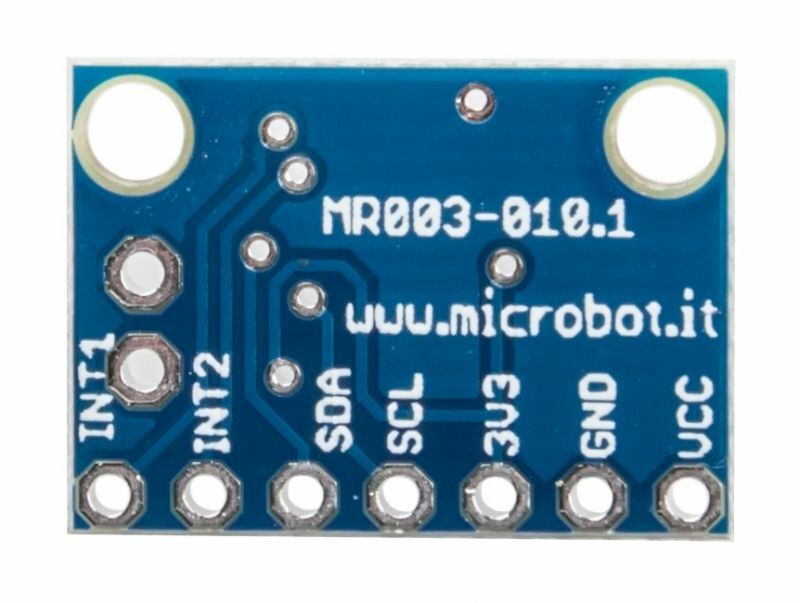 Its very small size (17.8x12.7mm) and its very light weight (only 1g), make it the perfect peripheral for small robots and for motion sensing systems. The MMA8451Q is a smart low-power, three-axis capacitive micromachined accelerometer with 14 bits of resolution. 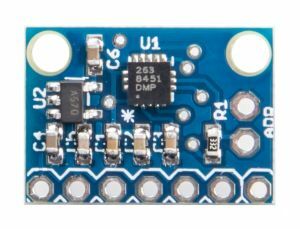 This accelerometer is packed with embedded functions with flexible userprogrammable options, configurable to two interrupt pins. Embedded interrupt functions allow for overall power savings relieving the host processor from continuously polling data. There is access to both low-pass filtered data as well as high-pass filtered data, which minimizes the data analysis required for jolt detection and faster transitions. The device can be configured to generate inertial wake-up interrupt signals from any combination of the configurable embedded functions allowing the MMA8451Q to monitor events and remain in a low-power mode during periods of inactivity. 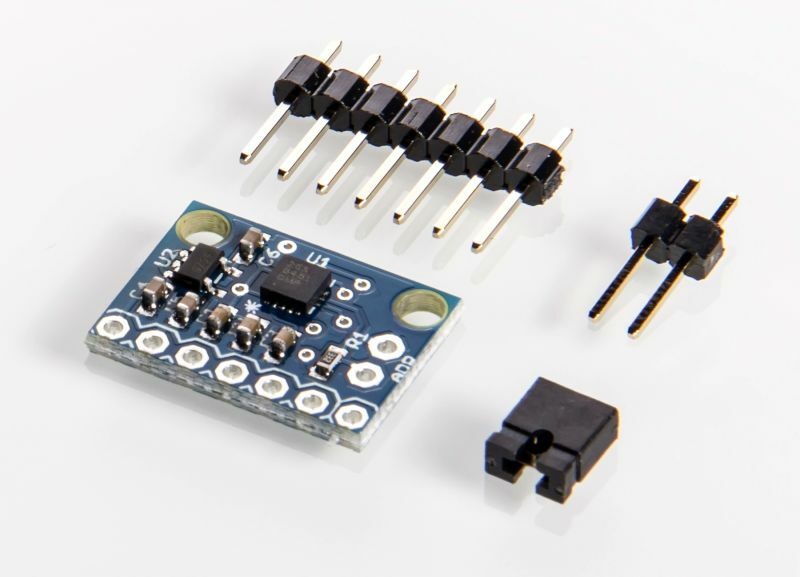 Another great feature of this product is the presence on-board of a 3.3V 50mA very low dropout linear voltage regulator, which allows this breakout board to accept a wide range of input voltages (2.7-6V). Due to the low power consuption of the MMA8451Q sensor a lot of power can be used for additional 3.3V components. Note that for power saving sensitive applications it is possible to shut down the sensor, reducing the current to less then 6uA. 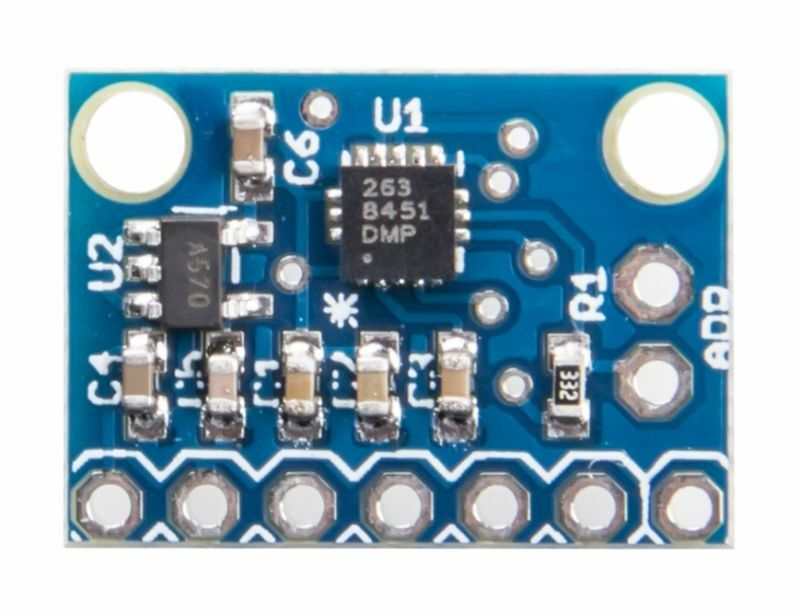 This board breaks out all the signals to a 0.1” (2,54mm) standard spacing header, in this way it is simple to use it with prototyping boards and also with breadboards. The board is provided with a 7-pins 0,1” male strip connector and with a 2-pins 0,1”male strip connector with related jumper.